Each week on Mondays, we will provide an image in need of a caption. You, the reader, should submit your caption in the comments below, on Facebook, or via Twitter (@CrookedScore). We will choose three finalists, including one winner, who will be revealed on Friday. The winner will receive one (1) prize: a mystery box full of CSB swag and other sports-related items. The two runners-up will receive amiable pats on the back (in digital form), and motivational speeches urging them to do better next time. This week’s image is below. Good luck! 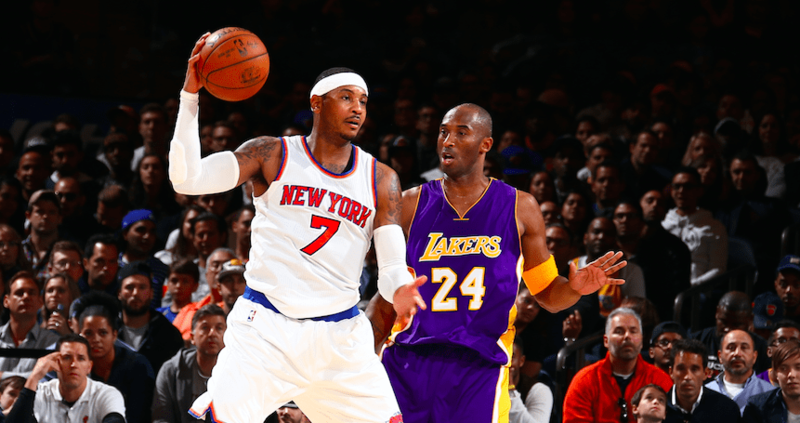 “Carmelo: Kobe, man, you ever think about why we’re here? “Carmelo: You ever just like…think maybe passing is an option?